Consumers love it. Musicians hate it. What is it? Music streaming. Okay, to be fair, that’s a vast generalization. But you will find that most music fans enjoy music streaming because it’s convenient, and it’s either free or low-cost. Some artists, on the other hand, have expressed disdain for it because it pays very little. It’s better than having your music stolen, but for many, not by much. Still, it’s mostly a fruitless pursuit to fight against what’s already here. So, we may as well embrace it, don’t you think? It is possible to make some money with streaming, and in some cases, you can even make a lot (although this is rare). So, how can you make more money from music streaming? Read on. Many artists complain about not making money with streaming and yet never make any effort to direct their fans to streaming sites and apps where their music can be heard. If that’s you, you’re shooting yourself in the foot! I know, I know. Tweeting about your latest release probably isn’t going to get a huge return on investment. What do you expect when you’re promoting your works for free? Social media is important. But it all starts on your website. You should be directing your fans to popular streaming platforms like Spotify, Apple Music and Google Play from your website to listen to your music. Your website should be the first result in Google when people search for you, and as more and more people visit your site, they will go to listen to your music on streaming sites. But you need to make it easy for them. Include a call to action in every blog post prompting readers to follow you on Spotify. Put a call to action in your email campaigns letting your fans know where they can stream your music. Ask your fans to listen to your music on streaming sites at the end of your YouTube videos (include a link in the description too). Make a Facebook ad promoting your latest release on Apple Music. Take out advertising on Spotify and prompt fans to listen to your new single. Include the icons of popular streaming sites on your business cards, posters, and other print materials. No, you may not see any short-term traction from your efforts. It’s all about the compound effect. If you keep doing these things, you’ll see your streaming revenue increase. It may only be a little bit at a time. But that’s better than none, don’t you agree? It’s like building your email list or social media following or anything else that’s worthwhile. Expect it to take time and effort. But I find artists are quite precious about their material. They hold onto unreleased tracks, alternative mixes, live performances, and other recordings they could be leveraging for more streams. This year, I re-released my Demos 2010 compilation under the name Fire Your God. I did not remix the tracks. I did not add any bonus tracks. And, as you can guess from the title, it’s mostly a collection of demos – not quality studio recordings. No, I don’t make tons of money from that release. But it’s helping me make some money. It’s certainly doing more for me out there than it is sitting on my hard drive. There hasn’t been any backlash either. None of my fans have come back to me and said, “dude, why are you putting out demos as an official release?” Sure, some have said they’d rather hear my new music, but that just tells me there’s a bit of a demand. So many of us artists strive for perfection. Yet, when you understand what it means to be successful, you realize it has nothing to do with having your ducks in a row. In my experience, success is messy. It just is. I once talked to Jack Conte (of Pomplamoose and Patreon) about this very thing. And he said he had to get used to the idea of releasing tracks that were imperfect and unfinished. Look, you can apply whatever philosophy or ideology you want to your release strategy. But if you’re serious about making money with your music, you must recognize that a bigger catalog is better than a small one. Every song is an opportunity! I’m not saying you should release junk. What I am saying is it’s important to adopt a “just ship it” mentality as Seth Godin is famous for saying. This is the first thing most people say you should do if you want to get your streaming revenue numbers up. And, if we’re to look at the example of Perrin Lamb, who made $56,000 in streaming revenue from a single song that was played 10 million times, it’s not hard to see why. You might strike it lucky and randomly get featured in a popular playlist. But more than likely, this is going to require some legwork on your part. You can’t just distribute your music to streaming platforms and hope for the best. You’re going to need to build contacts, reach out to them to have your song considered for placement, and persist in the face of rejection. Keep in mind, however, that you can also create playlists, and so can your fans, friends, and family members. You can reach out to artists you know and let them know you’re going to include a few of their songs in your playlist. This might incentivize them to promote the playlist, leading to more streams. It’s not always easy building from scratch, but if you can get enough activity happening this way, you will see good things happen. Also be willing to think outside the box and be an entrepreneur. Do some of your favorite coffeehouses, venues, and other retailers have playlists? If so, could you get on them? If not, could you help them set up a playlist or two and include some of your music in it? There are opportunities beyond the obvious, but you must be willing to recognize and seize them. AMP offers a new way to connect with your fans on the Pandora platform. The first step, of course, is to submit your music to Pandora. Unfortunately, not all music is accepted, so there’s not much you can do if you are rejected besides trying again with another release. If you’re on Pandora, then you can set up your AMP profile and begin creating messages for your fans to listen to. You can promote just about whatever you want, including music, shows, merch and anything else you can think of. The great thing about AMP is it can also help you gain insights into your audience. This type of data is always helpful when it comes to crafting effect messages and ad targeting. If you consider Pandora an important part of your online strategy, then you should give AMP a try. I’ve already given you a few unconventional tactics to help you get more streams. As you begin applying creativity to your marketing, you’ll start to recognize other opportunities. Nevertheless, here are a few ides worth exploring and developments worth tracking. Do you have some experience with a sound board? Have you done sound for events and concerts in the past? If so, then you might be sitting on an opportunity. Most events tend to need a little bit of canned music in between presenters, performers, and so on. 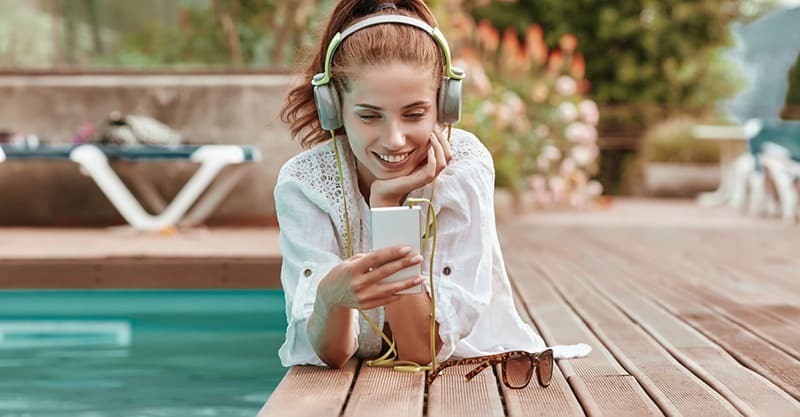 If your music suits the esthetic of the event, then you could have a playlist ready to go with your music in it (don’t just play your own songs though). I know, this isn’t necessarily a lucrative opportunity, but it could help you expose your music to more people. And, if people come up to you and ask you what you were playing, you could send them to your playlist on Spotify. We already know that a lot of people are listening to music on their mobile devices. So, we need to be thinking about how to connect with people on their smartphones and tablets. Having a website and a social media presence is a good start. But that may not be enough. If you have an app, not only can you get your fans to stream your music more, you can also get them to join your email list, come to your shows, buy your merch, and more. Another benefit is that it boosts your credibility. People tend to be impressed if they see you have your own app. There are some free solutions to help you make your app, such as Free DIY App Maker. These aren’t necessarily the best, but it is better to have an app than not. If you’re prepared to spend a bit, I would recommend having a look at EVO Band Apps. You’ll spend considerably less on this solution than getting a developer to put together a custom app on your behalf. There are so many ways of going about this. And yet, it’s astounding the number of artists who don’t have a release strategy. They just wing it most of the time. It doesn’t need to be anything complicated. But you should be thinking about how you’re going to get your music out into the world and the exact steps you’re going to be taking. For instance, you could release a single on streaming platforms before releasing your full album. That way, your fans would have no choice but to listen to it on their favorite streaming app. If they like the single, you should get a good number of plays. A month later, you could come out with the full album on CD (don’t digitally distribute just yet). Again, if your fans enjoyed the single, now they have no choice but to buy the album because it’s not available on Spotify or Apple Music. Finally, six months later (after you’ve toured and promoted your release), you make it available on streaming sites in anticipation for another round of streams. This is just an example of what you could do. There are plenty of other viable release strategies. The point is to have one that helps you build the biggest momentum and get more plays. Guest blogging for popular blogs can help you get more exposure as an artist. If you have a good idea of who your target audience is, you should also know where they tend to hang out online. Showing up in these places with a well-placed guest post can surprise and delight your fans and prospects. Most blogs allow you to include at least one self-serving link in your content, and if not, in your author byline. This is where you would send people to listen to your latest release on a specific streaming site. Note that this strategy can be time-consuming. The good news is that guest posting can help you long-term. If you create great content, it will continue to show up in search results, sending traffic to your music. Blockchain-powered streaming platforms are coming, although it’s not happening at the rate many have hoped for. Several experts and industry people have pointed to the blockchain as the cure-all to all our problems as artists. I think it’s good to learn about the possibilities, but I also think it’s a little idealistic to think that this is the panacea we’ve been waiting for. Still, there are platforms like Choon that are beginning to gain some traction. Be sure to distribute your music to these platforms once they begin accepting submissions. Making money with streaming largely depends on how serious you are about it and how much time you can allocate to it. Obviously, there are other ways of making money in music, and streaming isn’t necessarily going to have an immediate return on investment. So, you’ll want to think carefully about how much time you can commit to it, and how important it is to you.